Earlier this month at the verynice Women's Design Salon: Faces of Leadership we heard from Anne Kim, founder of Equal Pay Company and creator of “Faces of Leadership”. We talked about how leadership affects us in it’s different forms and compared our ideas about leadership to what data about our demographics says. Download this wallpaper for your desktop and for your phone! Through the “Faces of Leadership” game, attendees were challenged with evaluating who they consider their own personal leaders and the demographics these leaders belong to. Once they applied certain categories, such as ‘Race’, ‘Sexual Orientation’ and ‘Education Level’, participants were faced with the question if their personal leaders tend to fit into a certain niche and discovered that they have the opportunity to broaden their leadership demographics. At the conclusion of the game, participants shared select figures they admire and why, in an effort to introduce undiscovered leaders to each other. By the end of the event, attendees left inspired to broaden their leadership pool! Meet our verynice Fall Interns! 1) Tell us a bit about yourself. Born and raised in Dallas, Texas, I spent the first 18 years of my life nurturing my creativity through painting and drawing. Fast forward 2 years, I am a Junior at the University of Southern California studying Design to feed my creative outlet! 2) What are you looking forward to as a verynice intern? I’m excited to have the opportunity to work in various forms of design, such as print, digital, and UX/UI, but more importantly, to be making impactful work with creative people who also believe in acts of social responsibility! 3) What is your favorite social cause? I am passionate about equal education opportunities; having tutored children/teens throughout high school and organizing a free tutoring service at USC for local elementary and middle school students, I think it is critical to help those who do not have equal opportunities to learn to have access to great education and knowledge. 4) What passions and interests do you have outside of work? In between being a student and intern, I am the Editor in Chief of Roski Mag, a student run publication that showcases student art and design work. Also being interested in UX/UI, I have designed an app that helps people build mindful habits. However, when I’m not doing things to help me get my BA degree, I like to create die-cut stickers, riso prints, different flavored popcorn, and binge watch baking shows. 5) Who is your biggest role model in life? There are many people I look up to and take inspiration from, but my biggest role model is my mom. Although she is not a designer, my mother showed me from a very young age the importance of color theory and visual hierarchy, by letting me pick out colors and designs for her quilts. She has taught me to be empathetic, hard working, and loyal, by being an example in her own daily life. I strive to appreciate and utilize each day as deeply as she does, because as she likes to say, every day is an opportunity for new growth, no matter how small. It all started with The Beatles for me. As a kid, I was really influenced by their music & as I grew older I became influenced by the impact of the 1960’s counterculture movement. Currently, I’m a Graphic Design student studying at Art Center College of Design in Pasadena, where I'll be graduating this fall. Definitely working with an awesome design team, & I’m looking forward to helping create for companies & organizations that have an impact in the community. I’m most passionate about environmental issues. From overfishing to pollution to recycling I’m most interested in this social cause because it weighs the heaviest on our planets livable future. Although, due to habit & choice, I’m also interested in this social cause being one of the most accessible forms of impact an individual can participate in. So during this internship, I wanted to challenge myself to use transit as well as ridesharing with the homies. Live Music, Festivals, & Exhibitions are my favorite things to do, & each year I try to go as many as I can. I’m also really nostalgic, I love 16-Bit Video Games, 80’s & 90’s film/television as well as VW Vanagons. We were so proud to have been part of the Los Angeles Design Festival once again this past June. With well over one hundred guests huddled in at the ROW in downtown Los Angeles, we were heart-warmed by the record breaking attendance of our 'Freelance 101' event. Our four freelance experts shared their own accomplishments, struggles, tips and tricks for other freelancers seeking inspiration and support. Thoughts from our Desktop Wallpaper Designer, Olivia Sy: Being a freelancer typically goes beyond mastering more than one specific craft or skill. The ability to juggle various hats as a freelancer helps to define their value as more than a designer, artist, writer or consultant. These panelists made it clear that freelancing can be complex, profitable, fun and a dream in reach! Concept kudos to Alisa Olinova for the idea! Download this wallpaper for your desktop! We had a great time picking discussion topics out of a hat sent in by our community, such as "How do you establish trust with new clients and convince them of your value? ", and "How do you navigate being unavailable or overbooked for a project or client that you want to work with?" Though our panel was short, we loved hearing everyone continue the conversation and mingle while enjoying the event space after the panel. We were so thankful to have had such a great diversity of skill sets and knowledge being shared by our panelists and guests. Our community experienced the type of support and collaboration that makes the creative world feel more like home. We hope to see everyone at our next event! Please follow WDS on Instagram to stay in the loop! Interested in getting involved with the Women's Design Salon? Please get in touch at info@verynice.co! ...or how to donate services worth over $50,000 USD to three nonprofits in 24 hours. This is the third year that we’ve hosted the verynice CreateAthon at our Downtown Los Angeles office. Participating volunteers were inspired to give back to the community by providing round-the-clock creative services to meet each organization's needs. With a lot of hard work, creative support, and drive to help support a great cause, volunteers developed 20 deliverables over the course of 24 hours. Prior to the event, verynice's team met with each organization in order to develop an appropriate scope of work. At 10 am we kicked-off the event by greeting the nonprofit representatives, who came to present their mission and current challenges to the volunteers. After the Brief presentations the volunteers started creating teams of their preference. The nonprofit representatives stayed with their assigned project groups for about 45 minutes to answer any additional questions. 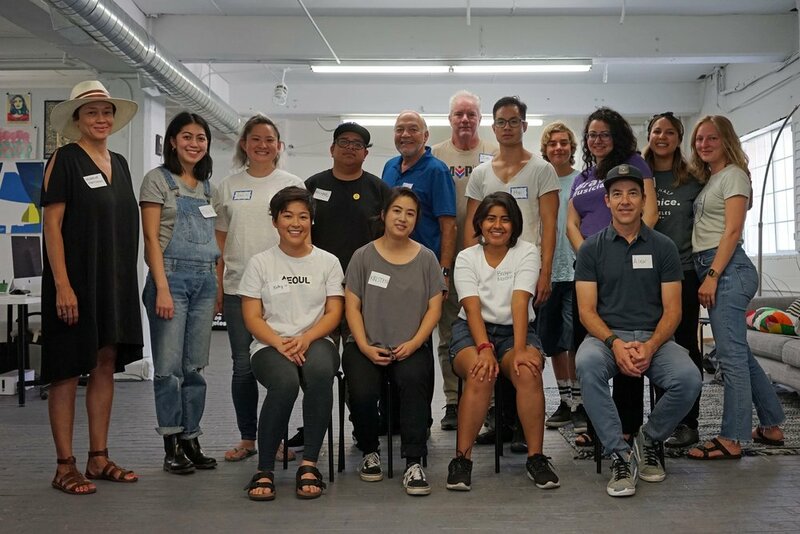 This was a great time for volunteers to connect with each other and grasp a personal understanding of their assigned organization. verynice handed each team a creative Brief outlining the needs that could be tackled over the next 24-hours. The nonprofit’s needs varied, but the majority focused on branding accompanied by a website or signage. Our goal was to give all designers the creative freedom without dictating the process. Each team was encouraged to explore whichever route they felt was appropriate and determine how the team dynamic worked or what parts of the brief they wanted to tackle first. About 4 hours in, verynice members did casual check-ins with teams to see where they were at. There was a variety of approaches taking place. Some teams were still exploring ideas, while others were heavy into research or creating content for their deliverables. Around 4:00 PM, the first round of group critiques began. For these presentations, teams were encouraged to share their progress as well discuss their next steps. Team members gave each other feedback and suggestions on how to tackle the challenges they were facing. The verynice members also participated in this creative exchange, offering support and professional expertise in various fields such as design strategy, art direction, or time management. The state of progress varied and while some volunteers were finalizing the sitemap, others were wrapping their heads around the mission statement. Everyone was motivated and very excited about finding solutions and providing tools that would help the beneficiaries in the future. Each team received rich feedback to move forward with. After the first round of group critiques it was time for a break. As a group we set out for local food at Wurstküche to unwind and have fun. Dinner became a time for reflection and further connecting across the teams. The group was diverse in age and specialization which made the networking opportunity so much more valuable! The 3-hour break was just enough to re-energize each volunteer to focus on the next sprint, followed by an hour long group activity to keep the spirits high and the body awake. To get the blood circulation going each volunteer showed off his or her favorite dance move performed to the tunes of Destiny’s child. After this rather hilarious experience we rolled dice from Matthew Manos’s impressive collection and shared among each other a number of personal trivia, providing a good dose of laughter. By 3:00 AM, the atmosphere changed from focused to sleepy and so a few minutes before the second round of critique was reminiscent of a rejuvenation fairytale. At this point, many ideas had transformed into a more concrete direction. The teams were advised on small issues but all in all everyone had a solid understanding of what needed to be done. Fueled by excessive amount of coffee the last 4-hour long sprint was as one would imagine - mellow, almost delirious, and yet very determined! One extra hour was dedicated to refinement and preparation of the deliverables and after that it was time to present the fruits of this creative challenge. At 9 a.m. with the arrival of each nonprofit beneficiary, breakfast was served. Despite the weariness from each volunteer, there was a positive and fearless attitude. Shortly after 9:30 AM we kicked off presentations for the nonprofits. It was a celebratory moment filled with many emotions. The Arlington Garden team started the presentation round delivering a refined Mission statement that captured the essence of this public garden operating on sustainable principles right to the point! Hai and Michael further presented the various design deliverables ranging from the Garden’s entrance sign, a standing map with legend (which included the garden’s history), Garden Etiquette as well as Landmark and Information signage. They also provided a revised Brochure that felt clean and aligned with the newly refined visual language. The next team to present was Dwelle Collaborative. This very talented team of three (Julia, Kristen and Bridget) presented Dwelle with a re-designed brand guidelines and a re-imagined website that showcased how well the volunteer team understood the nonprofit’s mission and current offerings. The navigation was made more clear and the content is now easily accessible to the audience. The website is nearly ready to go live and we are excited to see the impact this will make in further fighting human trafficking! 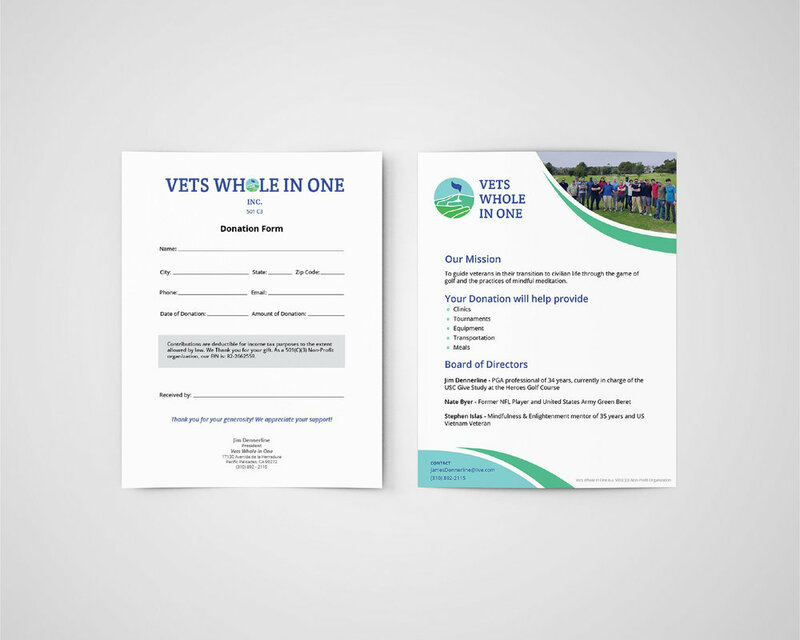 Vets Whole in One received an incredible package of deliverables that will no doubt aid their mission of supporting veterans who acclimate to their warm community. Marina, Soo and Kathy presented a brand re-design with brand guidelines, a (now live!) website filled with professional imagery from the non profit’s archive, as well as a re-designed flyer & donation form. Lastly, the volunteer team went above and beyond by thinking through a marketing strategy to set the organization up for further success in the future. By the end of the presentations, everyone was both excited about the work they had produced, and eager to get some well deserved rest. All the satisfied smiles of each beneficiary made this experience a very rewarding one and we couldn’t be happier that the event was so successful yet again! Agnesa Vavrinova, our Volunteer-In-Residence, provided Creative Direction for the initiative and teamed up with verynice's Operations Manager, Clarisa Valdez, to make this event possible, benefiting three local nonprofits in the Los Angeles area. Shout out to Matthew Manos for initiating the conversation by offering his first two recommended reads! According to Matthew, Papanek is great for digging into the “U” of UX. Matthew provided his second suggestion, which he said was peripherally relevant book, which one of his mentors used when he was in college. “Web UI Design Best Practices” Chapter 4: Understanding Visual Hierarchy & UI Patterns” (pages 31-50). Katharine Hargreaves provided a book by the talented Luke Wroblewski, describing him as “the king of mobile”. According to Katharine, the book is fantastic for web form design. Drusilla Ray threw out “Cadence and Slang”, saying that this resource “advocates evergreen guidelines for technology”. Though this is an “eccentric read” this book hold valuable information. Added bonus! Read the first chapter free here. At verynice we’re reminded every day that our greatest impact is made when we collaborate and work together. Thank you to all of our community members for being assets for designers, beginning and experts. To learn more about our community network visit verynice.co or contact info@verynice.co. Welcome to the team, Anders Tse! We're so excited to welcome an incredible new Strategist to the verynice family, Anders Tse! In this welcome interview we learn about his love of food, education, and all things design. I am a multidisciplinary design strategist on a mission to helping brands and organizations unlock the magic of design to shape a better world. My favorite design tools are Post-Its and collaborative teammates. It all started with a class at Cornell’s business school called “The Art of Innovation: A Design Thinking Immersion”, where a Stanford d.school coach taught us the value of empathy in business, ethnographic research methods, and rapid prototyping using fun materials like pipe cleaners and foil. Experiencing this human-centered approach to problem solving was so exciting to me that it influenced my decision to switch career paths from human resources to design strategy. After getting my Master’s in Industrial and Labor Relations at Cornell, I spent two years in New York as a strategist co-creating solutions in space planning, service design, and organizational design with higher education and cultural institutions. Now I am back in my native city of Los Angeles, delighted to be part of the verynice family and give back to my community through design. What are you most excited about for your new role? I have two things! First, I’m most excited about being in a position where I get to partner with passionate, mission-driven organizations to create authentic brand experiences, tell their stories effectively, and expand their capacity for impact. Second and last, I’m fascinated by the evolution of design strategy as a discipline and I’m excited to collaborate with a smart, tight-knit team on imagining what strategy at verynice and in the broader design industry will look like in the future. My favorite social cause is education, which is near and dear to me. I am a first generation college student and recognize my privilege in having the support networks and opportunities in place to get me through to graduation. As a country, I believe there is more work to do in designing education systems, both K-12 and higher education, that are equitable and inclusive of current and aspiring students from all walks of life. It’s encouraging to see the emergence of non-profits and social enterprises tackle various components of education in service of fostering environments that give every student an opportunity to succeed, from tutoring to hunger assistance programs. I feel alive when I am surrounded by mountains and lakes, so I’m grateful to be back in California and hike throughout the year. I’m always open to discovering contemporary artists that have a provocative point of view and tackle important social issues, so you’ll be sure to catch me at major art museums in Downtown and small local galleries. Lastly, I am passionate about experiencing and learning about the intersection of food and culture, so I’m looking forward to exploring the diversity of Los Angeles’ food scene and trying new cuisines in my travels. Last month at the verynice Women's Design Salon: Feminine Voice, we heard each other's stories and learned about Elle Luna's experiences. The painter, designer, speaker, and author of The Crossroads of Should and Must: Find and Follow Your Passion, walked us through the lessons in her new book, Your Story is Your Power: Free Your Feminine Voice. Thoughts from our Desktop Wallpaper Designer, Wilmer Gomez: The piece I created is like an emotional city map. I was thinking about the culture story that Elle was talking to us about and it made me think of the thoughts that go inside my head and the thoughts that might be running around inside people's heads, I created a map-like pattern to express the different stories that people might have to tell and no matter how small they are still important. The volunteer sharer standing in the middle of room offered that statement a little sheepishly after realizing she had perhaps involuntarily over-shared some stories from her personal life. And it was intimate. The setting for the night featured a tidy spread of sandwiches, wines, juices and snacks for a small gathering of people, mostly women, who had come to hear Elle Luna, artist/designer/author of “Your Story Is Your Power,” speak. The room was quietly lit and we were all sharing personal memories and stories with each other at Luna’s request. So yeah, it was intimate. How could it not be? This might have been Luna’s goal, though, as she spoke extensively about story: not only the stories we are told by the world at large and the stories we tell others, but also the stories we tell ourselves. Luna’s talk had moments built in for intimate conversation, the kind of talk that usually requires permission to share because it just might disrupt a mutual peace. The topics ranged from experiences with misogyny, to memories of families and childhood. They were interspersed between slides of Luna’s own illustrations and quotes from others on the importance of story, investigation, and your voice. While we’ve come to expect from talks and speakers a kind of riveting and impassioned thesis of wisdom or life changing affirmation, what Luna offered that evening was an intimate moment for people to open up and share something with each other. We all know there are a million ways to tell stories and connect. You can Snap, Like, Heart, Re-tweet, Add, Friend, and Follow whoever and whatever you like. But this kind of access rarely results in openness. Our stories and connections can feel inauthentic and guarded. The invitation to just turn to the person next to you and share something intimate, even in its awkwardness, felt like a relief. "In a very real sense we define our lives through our stories. Understand these stories, along with the motivations behind them, and we can positively change how our future unfolds." Be sure to check out the book Your Story Is Your Power: Free Your Feminine Voice! We're thrilled to announce that we have two open positions at verynice! We are currently looking for a Full-Time Strategist and Part-Time Assistant Project Coordinator to come join our passionate family of creative problem solvers. For over 10 years, verynice has helped businesses, nonprofits, and governments expand their capacity for impact through design-driven innovation. We provide hands-on strategic consulting and design services, facilitate workshop sessions, and publish a variety of open-source design methodologies. With client experience spanning 500+ brands including the American Heart Association, Disney, UNICEF, and Google, our expertise is centered around three key disciplines: Business Design, Brand Strategy, and Experience Design. We start every single project using the same foundation of core principles: co-creation, anti-assumption, legacy-driven impact, and generosity. To apply, please include the title of the position you are interested in in the subject line of your email. Please also include a resume, cover letter, and any other relevant materials. Email all of your documents to info@verynice.co by April 15th. The Strategist sits within the design team at verynice, and reports directly to the Asst. Managing Director in order to execute upon verynice's strategic methodologies, and lead a diverse range of client-facing strategic project and consulting initiatives. This is a full-time position, based in verynice's Downtown Los Angeles headquarters. Conducting and leading verynice’s strategy services including relevant research and project execution across the following service areas: brand strategy, experience design, business strategy/product development, facilitation, and general consulting. Leadership and mentorship for team members, ensuring the success of our projects, and the ultimate alignment with the client’s end goals. Participation in networking events and conferences, acting as a public face for verynice and delivering thought leadership in design, strategy, and social impact. Craft strategic recommendations, workshop agendas, and develop legacy documents for creative problem solving initiatives. 2-3 years of experience. A Bachelor's Degree in a related/relevant field. Must be detail-oriented and an excellent communicator. Great presentation skills and facilitation experience are necessary. Must be a quick thinker, and have a willingness to develop strong friendships with our amazing clients. Interdisciplinary Master's Degree (MBA/MFA) desired, but not required. The Assistant Project Coordinator at verynice reports directly to the Asst. Managing Director and Operations Manager in order to assist in the coordination and management of select projects, and to lead select administrative tasks such as project scheduling, outsourcing, and account management. This is a part-time, ~20 hour/week 6-month contract position to start with possibility for extension or full-time employment upon completion and review of the initial contract. Assist in developing proposals for new business based on historical data and insights from new business meetings. Assist in the development of project schedules, helping the Asst. Managing Director fit new project initiatives within the overall studio bandwidth. Lead project management for select client initiatives in both verynice's for-profit and pro-bono sectors. Work with the Operations Manager to review new talent and recruit new contractors and volunteers. Work with the Operations Manager to generate and track new project agreements and invoices, following up with clients to keep new business efforts on track. Work with the Asst. Managing Director in researching and vetting of new business opportunities. Assist the Managing Director in developing content for verynice's social media feeds and blog. Assist the Asst. Managing Director with miscellaneous administrative tasks. <1-2 years of experience. A Bachelor's Degree in a related/relevant field. Must be detail-oriented and an excellent communicator. Great presentation and creative problem solving skills experience are necessary. Must be a quick thinker, and have a willingness to develop strong friendships with our amazing clients. General knowledge of design or the creative process is preferred, but not necessary. Full-time employees at verynice have a range of added benefits including paid time off, federal holiday observation, sick days, opportunities for healthcare reimbursement, a work-from-home policy, and a volunteer day (aside from other fun shenanigans like karaoke and go karting). Call for Spring Visual Design Internship Applications! This is a flexible 16 – 32 hour per week position, and is housed in our downtown Los Angeles office in the Arts District area, requiring 2-4 full days in-house. Our business hours are Monday – Friday, 9am to 6pm. This is a 3 month position, starting early April, available for current students in their junior or senior year of undergraduate studies. Compensation options include a paid stipend or course credit. Deadline to apply is Sunday, March 18, 2018 before Midnight PST. 3) Are you looking for course credit? Social media can be a powerful outlet to share stories that can inspire change. The LA Mayor’s Innovation Team engaged verynice to collaborate on the creation of the “Our LAPD” campaign, an initiative to help build a more diverse and inclusive Police workforce. Spotlights were delivered through several social media ready assets including split images, fill in the blank images, and short video interviews. Video interviews share stories like “The First Time I Saw Me,” demonstrating positive experiences with officers or role models that shifted their perception or thinking and inspired them to become officers. Others focused on “The Shift," highlighting when the officers were able to shift others’ perceptions (like their family and friends) about policing. Officers are people just like you and me. Split photos showcase officers in and out of uniform with facts about them beyond their careers. This reminds viewers that officers are people in uniform; that they have familiar roles like “Single Mom”, “Immigrant, and “Foodie”. How well do you know the officers who patrol our city? The officers come from a variety of interesting backgrounds and have unique and quirky characteristics and interests. Fill in the blank images revealed interesting and relatable facts about officers with the prompt "You'd never guess that...". How would you serve? Understanding that the LAPD is really a reflection of the community, community leaders share their stories and what their communities need from the LAPD to help us build the force of the future. Community spotlights represented the voices of diverse community leaders from the religious, LGBTQ, human rights, creative, and government communities, and more. Video interviews captured each individual’s story, their organization’s mission, and their hopes for the future of the LAPD as it relates to their community. At verynice we focus on delivering projects that generate impact and leave a legacy for our clients. While these stories reflect the current views and experiences of the community, we also created a robust guide to create more content in the future. This compiled the project goals and materials into one document with instructions on conducting interviews, capturing photos and videos, editing the stories, and writing social media copy to share the stories. Our team had the pleasure of meeting 20 officers and 9 influential community members to capture their unique stories and perspectives. From an Olympic silver medalist and mother to a Paralympic gold medalist, to a previously homeless then NFL bound athlete, to a professional pianist, and several immigrants from around the world, we were touched by the stories of these women and men from diverse backgrounds. Heck, if we didn't love our jobs so much, we'd consider becoming officers, or detectives, or captains ourselves! 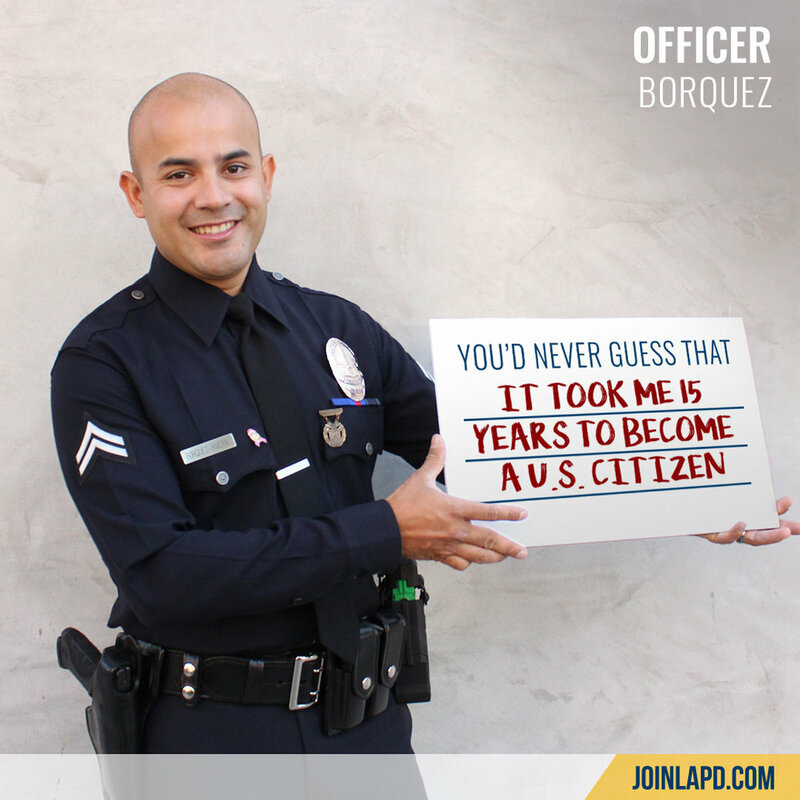 Did you know there are over 250 types of positions you could have within the LAPD? Be sure to follow the campaign as it rolls out this year on Facebook, Instagram, and Twitter.